The record intrinsic hyperpolarizabilities are plotted below. The number in brackets is the reference. 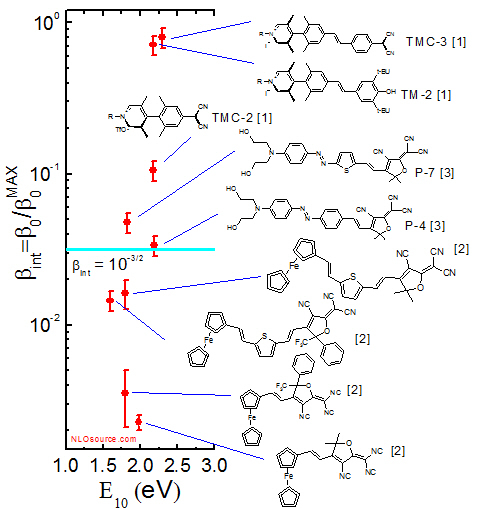 To submit your record results, click here, and send a jpeg image of the molecule(s), the measured value of the intrinsic hyperpolarizability, the energy difference between excited state and ground state, and a reference to the refereed article where it appeared. R.; Zuccaccia, C.; Macchioni, A.; Stern, C. L.; Liu, Z. F.; et al. J. Am. Chem. Soc. 129, 3267 (2007). Kaminsky, W.; Benedict, J. B.; Reid, P. J.; Jen, A. K. Y. J. Am. Chem. Soc. 127, 2758 (2005). Javier Perez-Moreno, Yuxia Zhao, Koen Clays, and Mark Kuzyk, Opt. Lett. 32, 59 (2007).